Recently we have been discussing within the teams and membership that a number of large jobs have been on the list for a considerable amount of time. The Trustees along with the teams have decided that we have enough jobs now to run a “hack the space” weekend. The purpose of this would be shutting the space during this time where no members other than volunteers of this weekend will be permitted to use the space. This will cover both upstairs and downstairs, the following jobs are currently in the plan. The Trustees request that all teams please keep thinking on what else needs completing and a wiki page will be set up so members can see the job list, place their names against the jobs and the times they can volunteer their time. Our proposed shutdown will be on 18:00 on Friday 8th February till 18:00 Sunday 10th February. As you are aware the Trustees are also taking a break for Christmas so I remind members that it make take some time to get any questions answered during this time. I will be taking point on this project and making sure that we have enough people to do the jobs along with materials ordering and liaising with Teams to make sure everyone can have a great day and take part. I look forward to posting more information in the near future. As you may be aware, we were unable to conduct the AGM in November as planned as unfortunately we had insufficient members represented either in person or by proxy to be quorate. Our constitution requires 20% of the membership to be represented at the AGM. As a result of this we need to re-run the meeting. The date for the Nottingham Hackspace Annual General Meeting (AGM) re-run is Thursday, 24 January 2019. 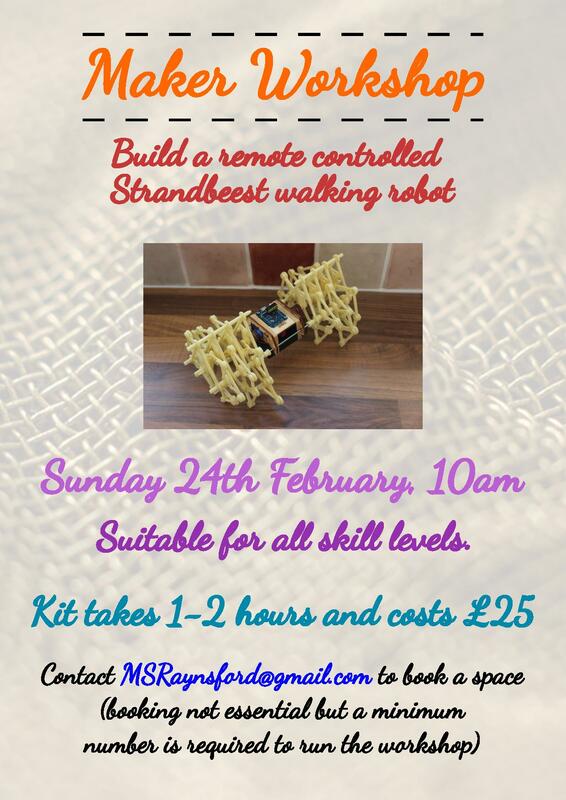 It will be held in the Hackspace Classroom (downstairs). Doors will open at 7.30pm and the meeting will begin promptly at 8:00pm. If you’re a member of Nottingham Hackspace, you need to attend in person or allocate a proxy to represent you at the meeting. We have a number of special resolutions we need you to vote on. For the AGM to happen we need 130 members represented. This is the required quorum as per our constitution. As per section 1.129 of our Articles of Association, if we do not have a total of 130 members (present and proxy voters) then we will not be able to conduct any business and will have to rearrange the AGM for another time. Thank you for being a Hackspace member this past year, and we look forward to seeing you or your proxy at the meeting. 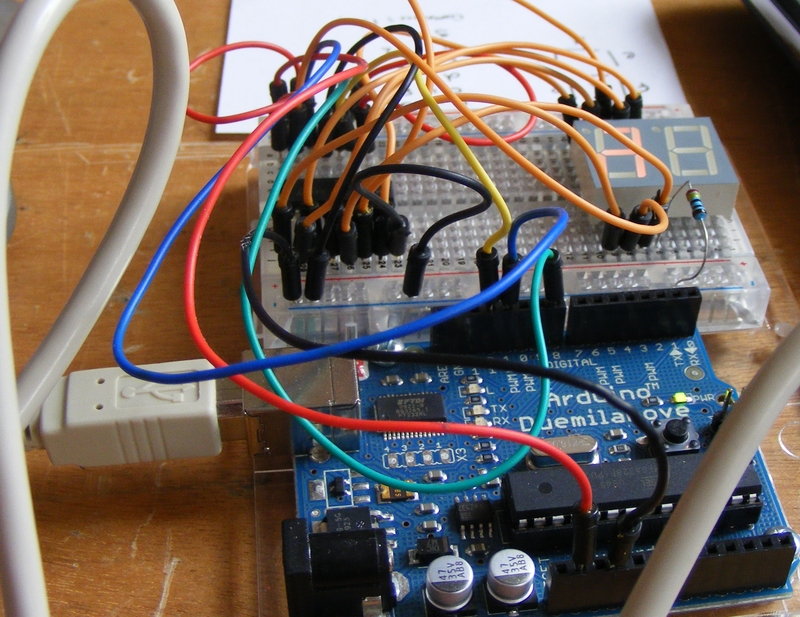 Nottingham Hackspace will be hosting the incredibly popular all-day Introduction to Arduino Workshop, run by James Fowkes and Ian Dickinson, on Saturday, 26 May. 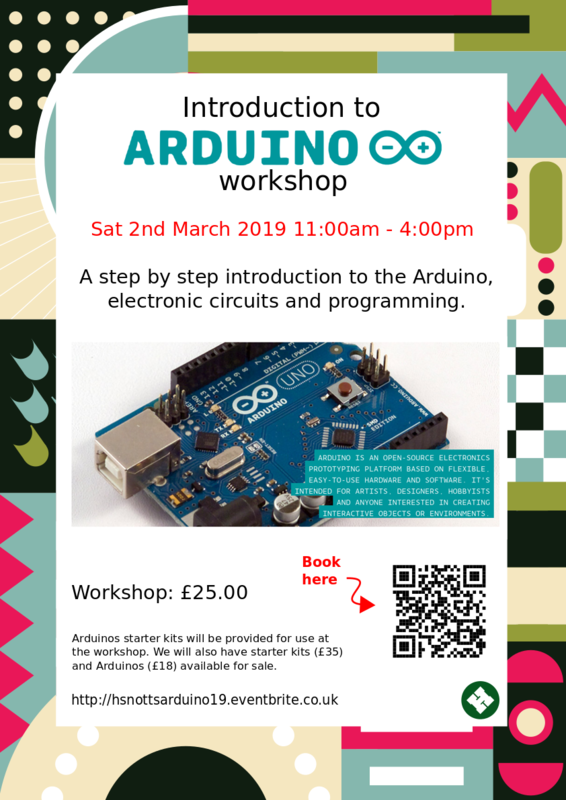 This workshop will run from 11am to 4pm, with a break for lunch at 1pm, and will cost £25, which includes use of all tools, boards and components, and free tea or coffee. Arduino Unos will be available to purchase for £18 and Arduino Starter Kits will be available to purchase for £35. Please bring cash if you would like to buy either of these. You can purchase your tickets now at EventBrite. 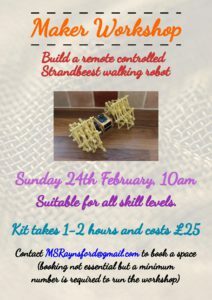 This is a very popular workshop, with a limited number of spaces, so please buy your tickets early to avoid disappointment. Nottingham Hackspace is an ideal place for people across all of Nottingham to come and develop their skills, whether that’s woodworking, programming, crafting, or art. These are frequently asked questions for anyone who works in the social care or community service industry as to what the Hackspace can and cannot provide. No. We’re a member-run non-profit community. We have no staff, and everything is done by a tireless team of volunteers. What can people do in the space? People can do anything that abides by our rules. Within the space, we have specific areas designed around the tools available – a craft area with sewing machines, fabric, and yarn; an electronics area with soldering irons, multimeters, and components; a laser-cutting area with a computer and laser cutter; a woodworking area with a table saw, a lathe, and hand tools; a metalworking area with a lathe, a mill, and welding equipment; and a separate room with a computer and printer. There is also an area with musical instruments and a library and a kitchen with a dishwasher, microwave, and oven. Except for events that are open to the public (such as workshops and open evenings), the only people allowed in the space are members and their guests. Any guests that are brought in by members are the responsibility of the member and agree to abide to the same rules as the members. The Hackspace is a fully unsupervised location, with members being responsible for their own safety and wellbeing. What do you expect of your members? We expect all our members to treat the Hackspace and fellow members with respect and care. Along with our rules, we also have a SafeSpaces Policy that we require all members to follow. As part of treating the Hackspace with respect, we expect all members to not only clean up after themselves, but to leave the space better than they found it. How can my client become a member? Your client must come to an open evening and have a tour. You (or any parents/guardians of your client) are also welcome to join. We have them every Wednesday, from 6:30 until 8:30. During the tour, our membership volunteers show off everything that is at the space, discuss how the space works, and talk about how membership works. Once the tour is finished, people can sign up to become members. An active email address is required to become a member, as well as regular computer access to receive emails from Nottingham Hackspace. Membership is paid via standing order. After entering in their email address, the potential member will receive a link to fill out more details. We require all members to provide their address and telephone number for legal purposes. Once those details are entered, one of the membership volunteers will review the details and approve them. An email will be sent out with our banking details and a reference code that matches up the monthly standing order with the Hackspace membership account. We do ask that members be over 18. We do have the potential for people over the age of 16 to become members, but only after their parents/guardians come in to discuss it with our trustees. How much does it cost to be a Hackspace member? There is no set amount for being a member – it is based entirely on how each member uses the space. As a caveat, it costs approximately £10 an hour to keep the space running – just paying the rent and bills. Please use that as a consideration when arranging the standing order. How is the disabled access at the space? The main entrance to the space is up one flight of stairs via a spiral staircase. There is a service lift and a rear door that can be opened. However, we cannot guarantee that the lift will be in working order at all times. We also cannot guarantee that the door will be unlocked. If your client requires access through the service lift and rear door, it would be ideal if you were to let the membership volunteers know ahead of an open night so they can prepare and ensure everything is working. Once your client is a member, they will need someone to accompany them to open the rear door after entering from the main entrance. There are plans in place to have a ground floor entrance, an internal stairwell, and a chair lift, but these are still in the planning stage. Within the space, we do try to ensure there is easy access through all areas of the space, but there may be areas that are wheelchair inaccessible. We also regret there are no disabled toilets within the space. There are three toilet stalls, but none have any railings or supports. Can I visit the space during my working hours? 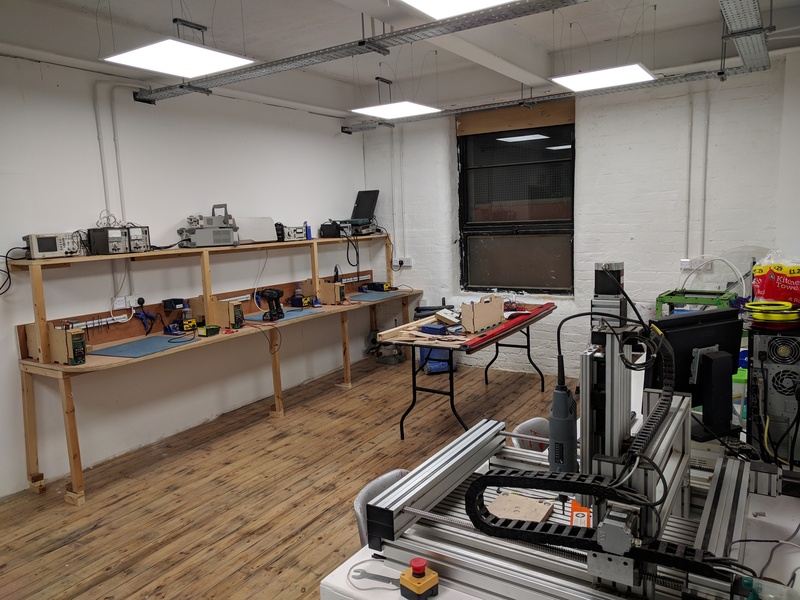 As the Hackspace operates entirely due to the work of its volunteers, it is unlikely that any of the membership volunteers will be available to provide a tour during working hours. If you client is a member of the space, you can visit during working hours with them as their guest. Can we use the Hackspace for our events? All events are run by members. If you are a member of the space, you can use it for your events, provided that you discuss it with the trustees in advance. How can I contact the space? There is no telephone at the Hackspace. The primary way to find out about membership is email membership@nottinghack.org.uk. Please keep in mind that the people answering the emails are also volunteers, and a reply may not be immediately, especially during working hours. To speak to the trustees of Nottingham Hackspace, please email trustees@nottinghack.org.uk. Please keep in mind that spam filters and network security systems may block emails from “nottinghack.org.uk” due to “hack” being in the address.